Check out the new public art exhibit at The Street! 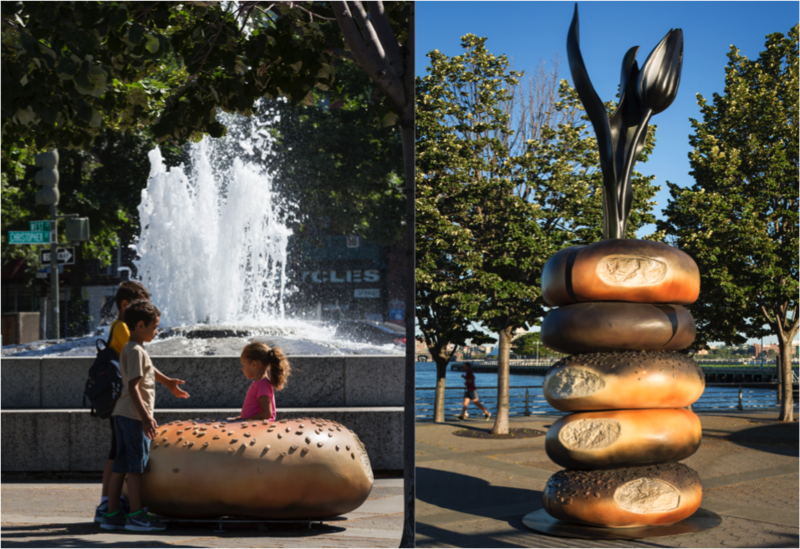 Everything will include three carved versions of bagels throughout The Street. One will be a single 5-foot wide, 2-foot tall bagel, another will be 5.5-foot tall trio of stacked bagels, and the third will be a tower of five bagels, standing at 15 feet tall, acting as a makeshift vase, with a tulip at its center. A bright spot this season, Everything will be on view through Winter 2016. Liden, whose work spans a variety of media, is known for her dynamic sculptural practice, in which she utilizes the casting process to seamlessly replicate and modify familiar objects. She views bagels as both “a great icon of urban living” and “a circle with no beginning and no end, evocative of the eternal cycle of city life.” Everything at The Street follows the exhibit’s inaugural installation in New York City, which was generously supported by Art Production Fund and Kiehl’s Since 1851. The Street’s love for art has led to three different installations in the past year and a half, each enhancing its incredible shopping experience with delightful cultural encounters. Objects of Desire, by acclaimed photographer Jessica Craig-Martin, remains on view at The Street, showcasing high-contrast, cropped, and fantastical compositions. About The Street: Located in the heart of Chestnut Hill, The Street has quickly become one of the region’s most delightful destinations for shops, eateries, entertainment and culture. Both a leader in national retail trends and a cornerstone within its Chestnut Hill community, The Street enchants its visitors with a collection of 40 unrivaled brands, as well as lively events by way of art, live music, fitness and kid-friendly fun. MiniLuxe and the first Juice Press in Massachusetts will soon open at The Street, happily neighboring the first Showcase SuperLux, Shake Shack and Splendid in the state, as well as such locally and nationally loved retailers as Vince, Ku De Ta, Jonathan Adler, skoah, Polkadog Bakery, Intermix, Calypso St. Barth, Del Frisco’s Grille, lululemon athletica, Pinkberry, Treat Cupcake Bar, Be Styled and Polarn O. Pyret. New tenants join an already robust lineup including The Container Store, Legal Sea Foods, Aquitaine, The Cottage, Star Market, Eyespot, Comella’s and more. The Street’s recent transformation under owner WS Development led Improper Bostonian to deem its Chestnut Hill home as Boston’s “Best Shopping Destination” and the International Council of Shopping Center’s U.S. Design and Development to recognize the property with a Gold Award in the category of Renovations/Expansions of Mixed-use Projects. The Street is located at 55 Boylston Street, Chestnut Hill Massachusetts, directly along Route 9, between Hammond Pond Parkway and Hammond Street. For more information about exciting events and retailer announcements, please visit www.TheStreetChestnutHill.com to join the e-club or follow The Street on Facebook: The Street Chestnut Hill, Twitter and Instagram: @shopthestreet. About Hanna Liden: Hanna was born in 1976 in Stockholm, Sweden, and lives and works in New York. Liden has been exhibited internationally, including exhibitions at Maccarone, New York (2014), Galleria Lorcan O’Neill, Rome (2013), MDC|Carlson Gallery project space in Paris (2012), Salon 94, New York (2010), Gewerbemuseum, Winterthur, Switzerland (2010), Palais de Tokyo, Paris (2009), Museo d’Arte Contemporanea, Rome (2008), the 2006 Whitney Biennial, Whitney Museum, New York, and Rivington Arms, New York (2004).